Price £1145 including VAT + £25 delivery - or collect for free if you wish! This little gem is the perfect starter quad for the smaller child. This quad bike has in-built safety features including a remote engine cut off fob that can be activated by a parent up to 100 metres away. The Apache Tomahawk mini quad bike is a proven favourite and without doubt, the best specified mini quad bike in its class. This quad bike has so many extra features such as 'full suspension', front AND rear brakes, headlight, and fully enclosed footwells for safety, and of course back up from Britain's market leader; Apache, this quad bike leaves the rest standing.Check out how much fun this looks like!! Price £1318 including VAT + £25 delivery - or collect for free if you wish! A brilliant all rounder - the RLX 100 quad bike continues to be the UK's best selling children's starter quad. 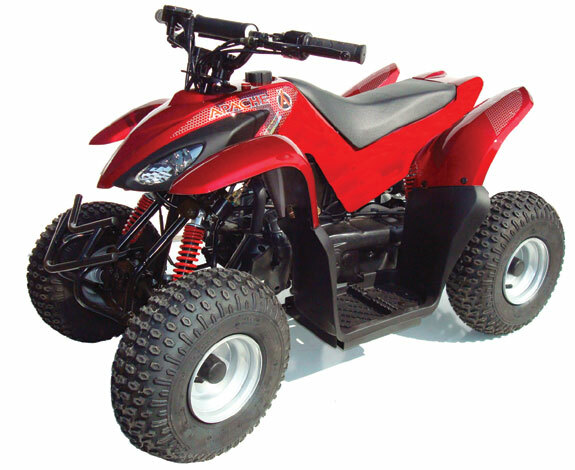 This legendary quad bike represents outstanding build quality and is superb value for money. 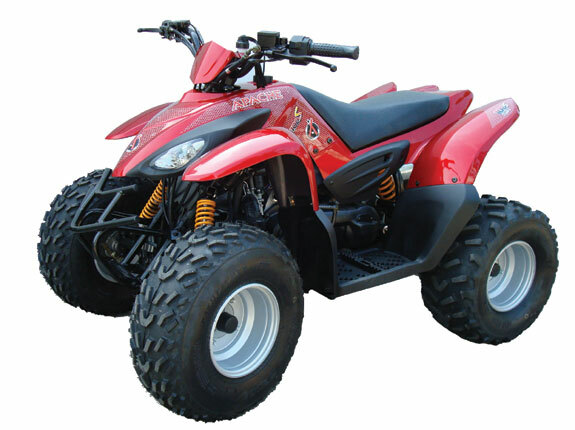 It has consistently been the UK's top selling and most popular Children's quad bike for many years. 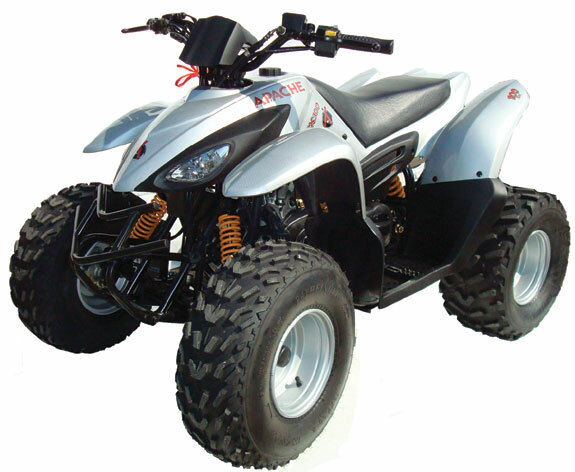 This quad bike has some outstanding features such as bright crystal white paintwork; a quality reliable engine, big mud monster tyres, and much more. It is one of the easiest quads to ride and is fully automatic with a 100cc engine. In addition, it has fully enclosed footwells for increased safety. I wished I'd had one of these when I were a lad! Fantastically priced TOP BRAND product with full Apache backup. A highly specified premium model for junior riders who like a few extra luxuries. This high specification quad comes as standard with bright metallic silver paintwork, reverse gear,digital speedometer and fuel gauge. It is fully automatic and very easy to ride. Top brand product at a highly competitive price. CE Approved Product. IMPORTANT NOTE: Due to our desire to continually improve our products, the specification may change without notice. The photographs shown are for illustrative purposes only and actual equipment may vary. If there is any aspect of particular importance or significance to you, please check with Apache or ensure you view the actual product you are purchasing before the purchase is completed. Price £1410 including VAT + £25 delivery - or collect for free if you wish! This Quad comes as standard in a high quality water based environmentally-friendly metallic paint, giving a superb showroom effect finish. The Apache F50 'ZR' Liquid Cooled, high performance race ready quad bike is highly specified, performance thoroughbred junior machine. It is ideal for the competent and/or competitive Junior rider. This quad bike will be in Glacier White colour scheme with a huge standard spec. This is the smaller engine version of highly regarded Apache F100 'S' which made its mark on the British Quad Bike Racing Circuit during 2008. The videos below show the F100 in action - a quad bike that is very similar. Price £1914 including VAT + £25 delivery - or collect for free if you wish! Safety Fully Enclosed footwells. Ergonomic kids size levers. 50cc High Performance Cylinder Head. 21mm Performance Carburettor with Performance Intake Manifold, Redesigned CVT Featuring High Performance Front Variator and New Improved Lightened Rear Clutch. Race Graphics. Extended A Arms. Extended Rear Axle. Anodised Frame. Warranty All Apache Quads come as standard with a 12 months parts warranty. This covers the product for general leisure use. This does not cover quads used for competitive motorsport, competitions, racing, track events, or corporate/commercial use. The 'Works' - a 100cc race ready, high performance junior quad bike that comes as standard with a huge range of performance parts fitted. Ideal for the competent and/or competitive Junior rider. Price £3118 including VAT + £25 delivery - or collect for free if you wish! Here's the specification - see for yourself! It goes like this - but quicker! VIDEOS - Please note that Apache test riders featured in our video clips are all highly expert riders and are in a safety controlled environment, with full safety gear and safety back up for filming. Less experienced riders should not attempt to copy these expert riders in any respect. All junior bikes are for off highway use only.